Tyne Bank Brewery: Ivy House Tap Takeover. Next week on Monday 28th September we are taking over the taps of one of Sunderland's best real ale pubs. 5 hand pulls and 1 keg line at the Ivy House will host a wide range of our delicious beers for you to sample, and we'll be along to chat, answer any questions and talk through the beers. 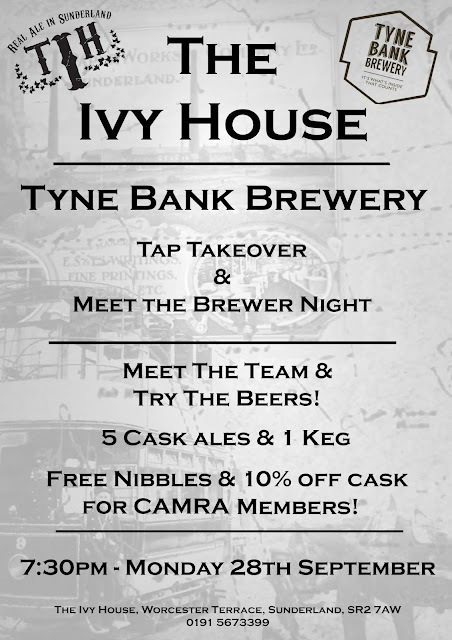 Twinned with The Northumberland Hussar in Heaton, The Ivy House is one of the first pubs in Sunderland in recent years to sell a good selection of cask ales and craft beers, with our ales being a regular feature on the bar. If you are a student returning to the city this month, its a perfect opportunity to discover our beers in a fantastic pub you may not have been to before. There will be a 10% discount for CAMRA members and free nibbles to compliment the beers. Meet the brewers. Drink the beer.